Researchers from the World Wildlife Fund in Mexico just announced some good news for butterflies: In December of last year, Monarch butterflies covered ten full acres of a mountain west of Mexico City, a dramatic improvement over last year. The Associated Press wrote last week that this marks a turnaround for the species, populations of which have declined over the past few years. The Monarchs are counted by the acre because they are so densely packed together that counting individual butterflies would be difficult and inefficient. In 2014, the butterflies covered 2.8 acres of land, and in 2013 just 1.66 acres. About 20 years ago the butterflies sprawled over a full 44 acres of Mexican land. Overall, there are probably around 150 million Monarch butterflies today, down from 1 billion in the mid-'90s. Along the way, they encounter numerous threats related to a changing climate, deforestation, and loss of milkweed—the only plant they use to breed, and upon which larvae feed and grow before they turn in to butterflies. The combination of these hazards has vastly impacted their populations. In a statement, Director General for WWF-Mexico Omar Vidal said that we've still got a long way to go to restore the Monarch population. He said, "Now more than ever, Mexico, the United States, and Canada should increase their conservation efforts to protect and restore the habitat of this butterfly along its migratory route." Sylvia Fallon of the Natural Resources Defense Council (NRDC) told Reuters that the "news provides a hopeful indication that we are helping them head in the right direction and curbing the loss of this magnificent butterfly," but added, "we must be careful not to declare victory too soon." 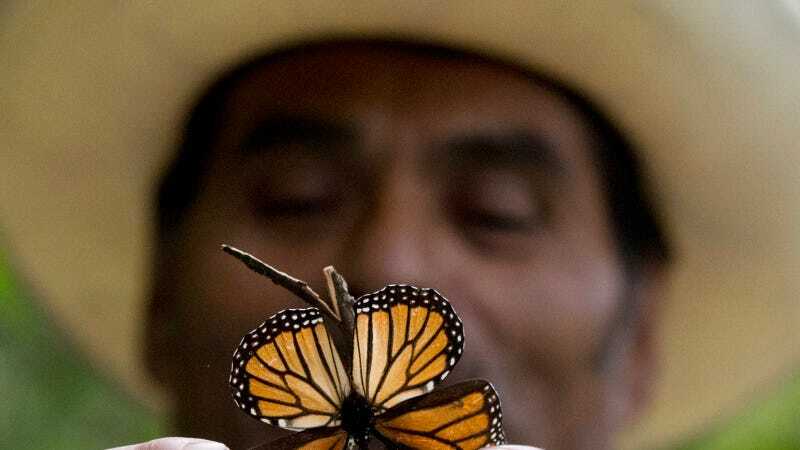 In order to reverse the downward trends recorded in previous years, the U.S. is bringing back milkweed and Mexico is trying to fight illegal logging, which depletes the number of trees in the reserves where the butterflies shelter from the cold. This year's news is a nod to the cooperative efforts taken by the North American countries. Alejandro del Mazo, who is in charge of protected natural areas in Mexico, stated that the population growth "is a motivation for us to continue building bridges between our three countries, not walls." Well said.